Those who read a lot of YA fiction have doubtless encountered many trilogies recently. Often, the second book is the least satisfying, merely providing a bridge from the first book (in which most of the world-building takes place and the characters are introduced and established) to the final book (which, one hopes, provides the exciting and dramatic conclusion). Gayle Forman wisely avoids this trap, opting to write books in pairs rather than in sets of three. I adored If I Stay and Where She Went, which together tell the story of Mia and Adam; she narrates the first book, he narrates the second. I was looking forward to Just One Day (the next book in this pair, Just One Year, comes out in the fall), and it did not disappoint. 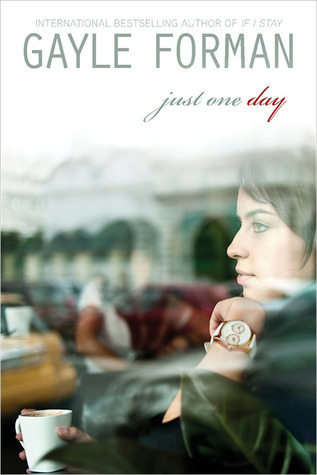 Just One Day is Allyson’s story. Like Mia and Adam, Allyson is leaving high school and entering the world beyond: in her case, college, preceded by a summer tour through Europe. Allyson, always a good girl who lets her mother run her life to a degree unfathomable by me, impulsively takes a day trip to Paris with a young actor she meets in London, Willem. Their day and night is eventful and wonderfully romantic, until she wakes up the next morning and discovers him gone; heartbroken, she returns to London and then home, vowing to forget him, but when that strategy proves a failure, she decides she has to find him, and find out what happened. There are so many great things about this book: it covers that transitional period between high school and college; the writing is lovely; Allyson’s friendships are realistic (she grows apart from a high school friend, miscommunicates with her roommates, finally makes a friend in her Shakespeare class), as are her relationships with her parents. For those who are partial to Shakespeare and European travel, those are bonus elements. Most of all, this is a story of personal growth, but it’s not a formulaic coming-of-age story; the author lets Allyson flounder for a while before getting back on her feet. This story ended in a perfect place, and I can’t wait to read Just One Year.